The wheel is probably the oldest and the most profound, important invention of our lifetime. And since its discovery that can be traced way back as early as the Mesopotamian Civilization, it has evolved into what it is today. 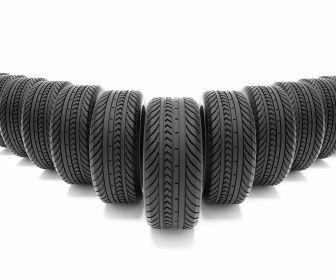 And thanks to John Boyd Dunlop, the development of modern tires greatly contributed in the efficiency of the wheel’s primary use in the automotive industry today. Before, getting a tire for your automobile is as simple as buying a candy bar down the newsstand. In the present, with those variations, specifications, profiles and series, buying tires for your car can be complicated and confusing at times. That being said, how can you be so sure you’re getting the right and the best tires for your vehicle if you decide to buy a set? Pull your hydraulic lifts and set it aside for a while and learn these basics in choosing the right tire for your ride. Vehicles –particularly automobiles, trucks and motorcycles – have pre-requisites when it comes to the ideal and correct tire sizes. This is important because the tire correlates with the size of the car’s wheel, as it also corresponds well with the performance of the car. A little adjustment in terms of size and profile could do significant impact to the feel, speed, traction and handling of the car. Usually, this is included in the manual, or inscribed in a metal plate attached on the bottom part of the door. Moreover, tire size can also be seen on the tire’s sidewall. To give you an idea, here is a size sample you usually see on the tire’s sidewall. • The letter corresponds to the type of tire (“P” for Passenger; LT for Light Truck; ST for Special Trailer; T for Temporary). • The first 3-digit number indicates the overall width or nominal section width of the tire measured in millimeters. • The first 2-digit number refers to the aspect ratio of the tire’s sidewall height to width. This is sometimes referred to the tire’s “profile”. We’ll get to this later. • The “R” tags the materials of the tire’s carcass; “R” stands for Radial. Other tags are “D” for diagonal and “B” for Bias Belt. • The next set of numbers implies the overall size of the wheel’s diameter in inches for tire fitting. This is usually what tire store owners ask when buying a tire. • Another set of numbers is for determining the load index of the tire. This index determines the maximum allowable load the tire can carry and endure at a specific inflation. • The set of letter/s in the end identifies the use and tire performance according to the manufacturer’s standards. M+S being can withstand Mud and Snow for most vehicles; M+T for mud and terrain, ideal for 4-wheel drives and trucks. If you own a sedan or a family wagon, then the “P” would suffice your needs, whereas if you’re using an SUV or pick-up, then you need to equip your ride with an “LT” tire to enforce endurance in longer mileage and traction. “ST” on the other hand is for larger trucks, RVs, buses and trailers, as it provides stronger sidewalls for handling excessive weights and rougher rides. Tires do have a life expectancy, mostly depending on your driving habits, general maintenance of the vehicle, road conditions and climate conditions. Based on this, tire manufacturers determine the lifespan of a particular tire in kilometers or miles. Although this pre-seen threshold is usually indicated on the sidewall or user manual, it is still advised not to solely depend on it. Despite manufacturer’s warranty/guarantee terms, you still have weigh-in your driving routine, frequency, distance, average speed and camber alignment, as the longevity of your tires will also depend on these aspects. Make it a habit to check the tread of the tires if they’re already worn out. Remember, the smoother and worn out the tread is, the more risks of danger await. Don’t go for low-profile tires if you are for durability and outlasting resilience. Low-profiles are not advisable for family cars and station wagons, as these types of cars are intended for comfortable driving. Low profiles tend to give a bumpier and stiffer ride, not to mention, much pricier and more prone to breaking your rims. On the other hand, if you are looking for sleek looks that will complement not only the cosmetics of your ride, but also performance in terms of speed, faster brakes and improved handling skills, then go for low-profile tires. With those tractions, profiles and tread, it seems that buying a tire today needs a lot of thinking now. It may look simple at first, but once you understand and feel the effect of the tires, that’s where you’ll know the difference. More so, if you’re planning to modify or upgrade your tires, best is to ask for recommendations from tire experts before pumping your service jacks. House Jacking: Why Do It? Abest Industrial Supply – A Division of Paltrol International Corp. Copyright © 2014 ABest – All Rights Reserved.